Achieve contaminant-free paint in half the time of traditional detailing clay! As a car care enthusiast, you’re on the continuous search for products that give your vehicle a better shine in less time. The Speedy Surface Prep Towel re-writes the rule book on paint decontamination by removing above surface contaminants, such as bugs, tar, over spray and rail dust, through the use of advanced polymerized rubber technology. This means you can remove destructive paint contaminants more effectively while spending less time doing so. Detailing clay quickly became an essential step in car care and detailing when it was introduced in the early 1990s. It was understood that the cleaner the paint, the better a wax, sealant or coating would bond to it. Through the use of abrasives in the clay and the motion of rubbing the clay bar across the surface, bonded contaminants such as bugs, tar, over spray and rail dust are easily removed. The Speedy Surface Prep Towel takes paint decontamination to a whole new level by applying 21st century technology to it. The Speedy Surface Prep Towel is essentially a microfiber towel with a high-tech polymerized rubber coating applied to one side. This polymerized rubber coating grabs above surface contaminants and pulls them away from the surface, leaving you with contaminant-free paint. As a detailing enthusiast, you should know that shiny paint comes from clean paint! A traditional detailing clay bar will yield 10-20 uses, depending on how contaminated the surface is. The Speedy Surface Prep towel will provide up to 100 applications, making it far more cost effective in the long run when compared to traditional detailing clay bars. What if you drop the Speedy Surface Prep Towel on the ground? Don’t toss it like you would a clay bar! Simply rinse it off with water and it’s ready for action once again. 1. 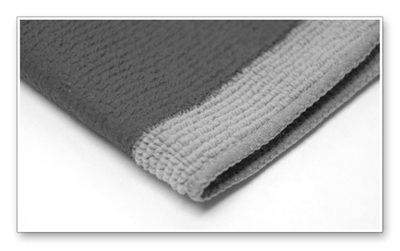 The Speedy Surface Prep Towel comes with a protective coating from the factory. Before using the towel, you must break it in. Saturate the towel with a clay lubricant and using no pressure, wipe the towel back and forth and then up and down on clean, lubricated glass, such as your windshield. After several passes, the protective coating will be removed and the Speedy Surface Prep Towel will be ready for use. 2. Fold the Speedy Surface Prep Towel four ways and work one panel at a time using a high quality clay lubricant. Spray the area and without applying any pressure, move the towel back and forth in one direction and then up and down in the other direction. Make sure that you are using a fast hand motion. Do not move the Speedy Surface Prep Towel in circles or go outside of your lubricated area. 4. Remove any excess lubricant and move on to the next section. Note: If you drop the Speedy Surface Prep Towel on the ground, simply rinse it with water. Do not use harsh detergents to clean the Speedy Surface Prep Towel. A mild soap and water solution is all that’s needed. Bye Bye days of rubbing cumbersome clay bars across your cars paint. This speedy prep towel works great and is a real time saver for removing decontaminates from paint.